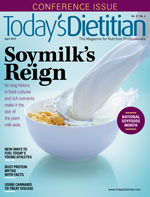 Nut and grain milks may proliferate, but soymilk remains the ancient and humble nutrient powerhouse of the plant milk world. Linda Shoaf, PhD, RDN, LDN, discusses the helpfulness of menu calorie counts. Whitney Reist, RD, LD, shares her Easter Brunch Grazing Board.